Award-winning insolvency specialist Andrew Cawkwell and senior solicitor James McEwen both join the successful, Knaresborough-based firm as it opens its 11th office in the North East. Andrew, (who grew up in York and is a graduate of Northumberland University) joins the professional, friendly team at Newtons from Muckles, where he was a Partner. James, who will be dividing his time between Durham and Darlington, was previously at Samuel Phillips Law Firm, where he was an Associate. With a highly-regarded reputation for delivering practical, strategic advice to businesses in difficulty, Andrew is also renowned for being the first practising solicitor in the UK to become dually qualified as a certified turnaround professional. The latest office move is part of Newtons considered expansion as it invests in its services to clients, builds its team and opens in new locations across the North East. Andrew will be heading up the new office in Durham, based at the sustainable, eco-building, the Rivergreen Centre, owned by digital-only Atom Bank. “The sustainable, innovative office space at the Rivergreen Centre is an ideal location for our forward-thinking brand,” says Newton, of the eco-friendly, low-impact business space, where it is a tenant of Atom Bank. 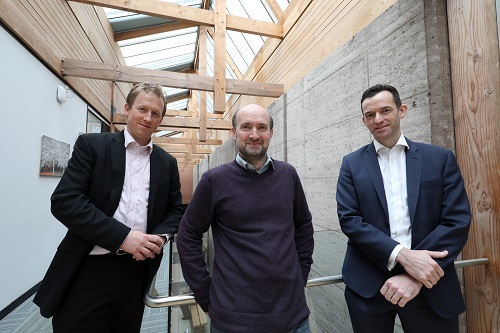 Not only are Newtons tenants of Atom Bank (which supported the establishment of the Rivergreen Centre) but the law firm has joined the panel of legal advisers to the state-of-the-art bank.